Originally Posted on the KeyLines Blog A few weeks ago, we had the opportunity to speak about KeyLines and graph visualization at GraphConnect SF 2014. The 700+ graphistas in attendance needed no convincing about the power of graphs. The “Graphs are everywhere” maxim has long settled into the collective conscious of theNeo4j community, sparking a whole ecosystem of startups, services and tools as well as a wave of innovation across big business. But what about data that isn’t inherently graphy? We wanted to show the benefit of visualizing data that we don’t automatically think of as a graph, using KeyLines. Given an audience of Neo4j enthusiasts, we decided to look at Neo4j itself. This blog post shows how we used the GitHub API to visualize how Neo4j’s is built and maintained. Forking – copying a repository from one user to another. Pushing / pulling – managing revisions back to the project repository. Merging – to merge the changes back to the main repository. With 17 million repositories and 7.5 million users, great rivers of data are flowing through GitHub every second. The potential for insight into how projects and teams work is huge. Contributor charts can show when the highest volumes of contributions were made. Focusing on the contributors and files in isolation means we’re missing an entire dimension of data insight. Including the relationships between different entities enables a richer, deeper analysis of our GitHub data. To build our application, we broadly followed five steps: gather, model, design, refine, and interact. The information we gathered related to commits within a specific time period and the meta information relating to the commits (represented as links in the chart) as well as the files modified and users responsible for the commit (each of which were represented as nodes in the chart). Converting flat data to a graph model can be complicated. There are many different combinations in which entities can become nodes, links or properties of nodes and links. The questions you want to ask of your data should define the model used. More detail on this process is in our blog post Building Great Network Visualizations. 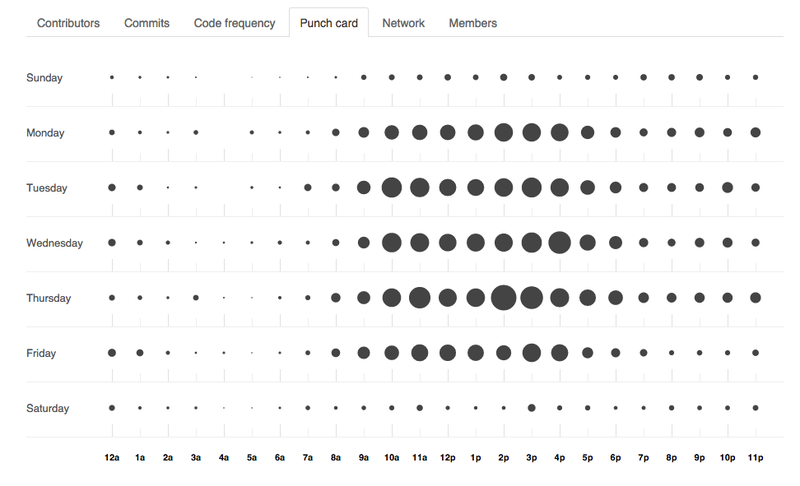 GitHub collaboration mapped to a graph structure: contributors and files are nodes, links are commits. Links are colored dynamically from a scale of red to green, where red means the commit has removed more lines than added lines, green means the commit has added more lines than removed lines and yellow has roughly equivalent additions/removals. Data slurped and model (loosely) defined, we can get start building the application. All the data was time-stamped, so incorporating the time bar was a no-brainer. To give the application a different ‘look and feel’, we decided on a black background to the chart and time bar. Most commits have a mix of deleted and added lines, so we wanted to color links on a red-green scale programmatically. Contributor and file icons would be extracted from the GitHub API. Basic application running, we set about refining the behavior and tweaking the appearance. We’ve found the best way to do this is through basic UAT. Giving the app to someone who hasn’t used it before and asking them to answer some questions. The ability to double-click nodes to link to GitHub files and profiles. So, what can we learn from the graph? Now we have a functioning graph visualization application populated with10 days’ worth of repository data. But what can we actually learn with this tool? The time bar offers an instant view of commit volume through time. But unlike the charts provided by GitHub, the time bar allows instant filtering of the time range to investigate peaks and troughs in productivity. This BackupServiceIT.java file was one of the most heavily edited according to our data. Selecting it, we can see who has contributed, how many lines each contributor added or deleted, and also click through to the file to dig deeper. Likewise, ExpandPlanningIntegrationTest.scala had four contributors during this time period. The time bar shows a red selection line indicating commit activity for this particular file versus total commits in the project (grey bars). From this data we could reasonably surmise that some core and/or refactoring changes were being made by the contributors and they updated this test file accordingly. Watching the second relationship over time, we can see each developer working independently on files before partnering. Obviously, we’re only looking at a tiny subset of the data available here, but in about a day we were able to build a functioning visualization application to help us understand how a team and a project is working. If you would like to try it for yourself, just get in touch – we’d love to hear from you.